DePaul just can’t seem to catch a break. They face off against the team that started their six game losing streak, and now any chances of coming out with a victory Wednesday night has dropped immensely. Yesterday, school officials announced that Cleveland Melvin, the Blue Demons’ top scorer, is no longer enrolled at the university. Melvin had not played in the last four games until receiving the boot on Monday. He was suspended in violation of team rules, not much has been said about the matter. Melvin was leading the team this season with an average of 16.7 points per game and 6.4 rebounds per game. DePaul will surely miss their star player, who was named the Big East Rookie of the Year his freshman year and has been a top contributor for the Blue Devils year in and year out ever since. As for the Wildcats, it’ll make preparation a lot easier. Although, they were most likely gearing up for Wednesday night’s game with Melvin not returning, now there is absolutely no possibility that he will be on the floor. Melvin did play in the first meeting, but the Wildcats still won comfortably. Melvin had 10 points and 4 rebounds in the 88-62 Wildcat victory. While those who were injured for the Blue Devils have returned, one of their biggest pieces will not be rejoining them. 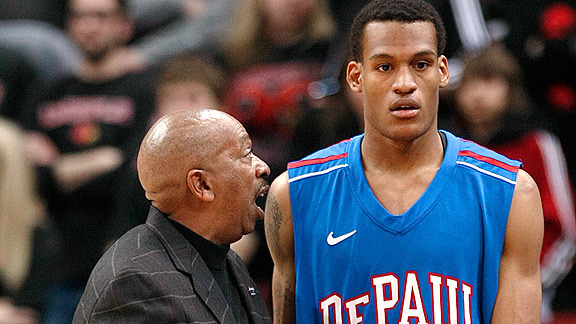 DePaul has had a rough few couple of years, and it’s looking like this season won’t end nicely for them. Once again, Villanova should win this one comfortably and hand DePaul their seventh straight loss. Villanova will cruise to victory tomorrow night and then it’ll be onwards to Omaha for a much anticipated rematch with Creighton.